And on the thirteenth day, I rested. As of today, I have been gone thirteen days. Today was my first day off in that period of time. We completed setup yesterday. The security sweep began this afternoon and lasts until tomorrow morning. Tomorrow we begin production in earnest. Today was our one day for ourselves. Jim went over to the media center workspace this morning just to check and make sure everything was still running smoothly. Other than our connection on the center camera platform being mysteriously disconnected– it was working just fine on Friday when I tested it– everything was groovy. Jim got the connection corrected in short order. Off to find some fun. So on our day off, Jim, Tony and I headed over to the Minnesota State Fair. 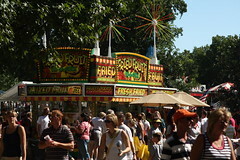 The Minnesota State Fair may be one of the largest state fairs in the United States. Measured in terms of daily attendance, it probably is the largest state fair. 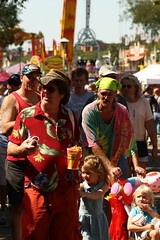 The Texas State Fair is arguably the largest in terms of yearly attendance but it also runs for twice as long. So who’s to say. It was big. This was certainly the largest fair– county, state or otherwise– I have ever attended. The three of us meandered around the fairgrounds and sampled a number of different treats. Bavarian weisswurst, elephant ears, cheese curds, beer. We rode the skyride tram over the fairgrounds from one end to the other, visited the horse paddock, listened to some live music, learned a bit about state history and met Princess Kay of the Milky Way. There was no rush. No place to be. No obligations to meet. No deadlines. We walked and talked and ate and drank and enjoyed a gorgeous, sunny day at the end of summer. I do want to say something about food on-a-stick. Food on a stick is a standard at every Midwestern summer event I have attended. Why this is, I don’t know. It just is. 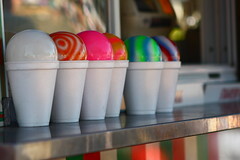 Go to a fair sometime in the Midwest. You will find food on a stick. I guarantee it. Pie on-a-stick, frozen bananas on-a-stick, pizza on-a-stick, cheese on-a-stick. Today I ran into a variation I had not thought possible: fresh fried fruit on-a-stick. I am not the only one that has noticed the food on-a-stick phenomenon. Over at the Heritage Tent they were celebrating Minnesota’s 150 years of statehood with a musical history tour, “Old Minnesota, Song of the North Star”. The show takes the audience through the state’s history with short reenactments, musical numbers and general good fun. I saw one particularly appropriate description of the show on my way out: a state on a schtick. I thought that was great. I admit that I have always been attracted to people, places and events of Americana. I’ve been to the Covered Bridge Festival in Rockville, Indiana. County fairs in several midwestern states. Countless roadside attractions from Death Valley to Wall Drug to Sleeping Bear Dunes. I take simple pleasure from them. They help to put large swaths of my life into greater perspective. Today I added the Minnesota State Fair to the list for no particular reason than to just go and enjoy. Besides, who can say no to elephant ears? I mean, really.